THERE would be few things worse for a fashion designer than for one’s latest looks to be greeted with hysterical laughter. 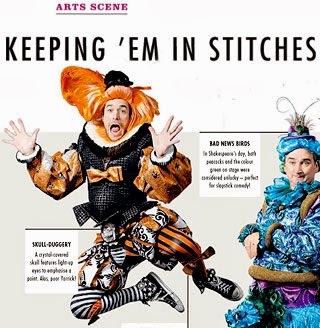 But when the curtain goes up on her creations in The Complete Works of William Shakespeare (Abridged), that’s exactly what costume designer Ailsa Paterson is aiming for – and she’s never disappointed. “It actually takes a little while for the laughter to die down before the actors can start the show,” she says. Still, when one of your costumes features a prominent codpiece made out of a peacock plush toy, you’re practically guaranteed to have your audience in stitches (pun intended). After a successful premiere in 2010 and a popular return season in 2011, the State Theatre Company comedy – which famously features Hamlet, done backwards, in three minutes – is back for another run before embarking on a three-month national tour. “We had to do some things like making launderable removable lining, now that we know how sweaty the boys get,” she laughs. their own right. Not that the show needs it – with actors Nic English, Tim Overton and Damian Callinan racing through all 37 of the Bard’s plays in under 100 minutes, they’re already playing at least 30 characters themselves. “There’s a very conscious theatricality to the show, these three actors are playing actors playing Shakespearean performers,” Paterson says. And while Shakespeare’s works may be abridged, costumes are anything but short on detail. Each is constructed from a dizzying array of modern fabrics like stretch lycra, sequins, Chinese brocade, leather and even PVC, in a humorous, modern take on Elizabethan fashions. “I did quite thorough research into the historical costumes of the time and while I have used those silhouettes quite faithfully I’ve then just gone to town using interesting contemporary fabrics and drawing off contemporary fashion ways of revisualising those costumes,” Paterson says. at the Adelaide Zoo, which Paterson has rigged with tiny lights to fl ash at comedically appropriate moments. It’s a bit of a departure for the NIDA graduate, whose last job was designing costumes for State’s April production of Hedda Gabler. “That was a very serious, depressing production, so it’s kind of wonderful to have the contrast of working on something so lighthearted,” she says. “Generally if I do a show that requires period costuming, there’s a sort of seriousness to how you approach that and historical research that makes you want to do quite a faithful interpretation. It’s more about a realistic look for the characters. First published in SA Weekend, July 27, 2013.